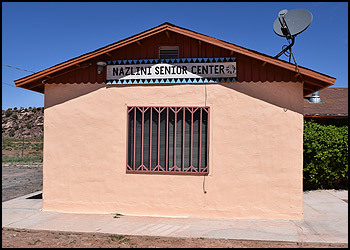 The Nazlini Senior Center provides services to the Elders living in this small community, located in the middle of the Navajo Nation. The Nazlini Senior Center provides services to the Elders living in this small community, located in the middle of the Navajo Nation. The Southwest Reservation Aid (SWRA) Program’s Food service provides a regular shipment of food staples to assist the center in saving money. This helps them purchase other healthy food items for the daily meals provided to the Elders. The center also offers activities for the Elders while they are waiting for the meals to be served. A nice-sized exercise room, located next to the dining area, provides Elders a chance to keep fit. They can work out with hand weights, cycle a couple of miles on a stationary bike, or walk a couple of laps on the treadmill if they choose. One gentleman used the weights during our interviews and was very confident with the 25- pound weights. Another group of Elders sat and played cards at one of the tables until their meal was served. 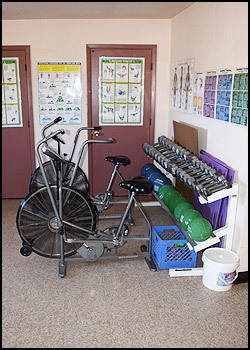 A nice-sized exercise room provides Elders a chance to keep fit. One of the newly hired staff members and center participant, Fannie C., graciously spoke with us about the center and her life. Fannie is 64 years old. She quit high school during her junior year to care for her ailing mother. She completed her GED later so she could work in her community. She has worked as a teacher’s helper and was returning to part-time work at the senior center to help with the cooking. When Fannie came to the center on the day we visited, she had just completed chopping wood. She really likes the quiet that the community offers and said, “It’s peaceful. I don’t think I like a lot of noise and the air pollution” of larger cities. Fannie was returning to part-time work at the senior center to help with the cooking. 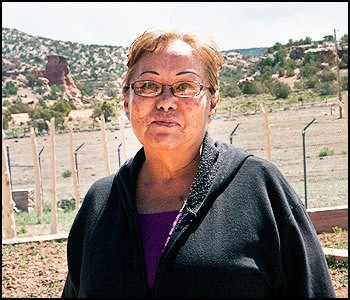 She does travel outside the community to shop for food, usually going to Chinle, Window Rock, or Gallup. The roundtrip mileage varies from 45, 100 and 160 miles respectively. The trading post in Nazlini made it easier to pick up items quickly, but it closed down over 10 years ago. Traveling for even a single item is a necessity. The majority of the households in Nazlini have electricity and about 85% have running water. Fannie uses propane for her cook stove and refills the tank every three to four weeks, costing about $20 each fill. Fannie is thankful for the Nazlini Senior Center for many reasons, but particularly grateful for the nutritional services offered to the Elders. She also appreciates the opportunity to work and help others as one of the cooks.